thank you. very good service. Great product and seems well made. Getting the batteries (which are supplied with it) in took moments and it was ready to go. It may take a couple of attempts to get it positioned correctly but this is very easy to do and once you get it in place it stays put. 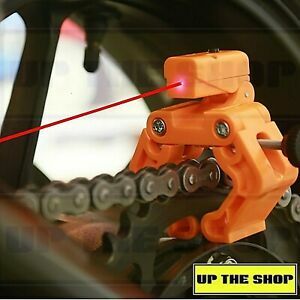 The laser can be seen clearly on the chain and again, moving its position didn't shift the tool at all. There is definitely cheaper ways of doing the job but this is by far the quickest and easiest method I have tried. Overall I would certainly recommend the it, it may be a one trick monkey but it’s a cool tool to have none the less. The idea of aligning your chain is great, but unfortunately this item is poor quality to provide the best accuracy, slightly overpriced for what it is, I would pay more for a better quality product. Just clamp onto the rear sprocket, and shine the laser pointer up and down the chain. Couldn't be much simpler. Presumably the further up you can point it the more accurate it'll be. I had to remove my chain guard on my 2007 ZX6R but that's easily done. Simple & easy process to ensure the front & rear wheels are aligned (as well as the sprockets & chain). I used it with the chain monkey at the same time. Basically attached the chain monkey to the chain & the laser monkey on the top of the sprocket. I then adjusted the rear wheel until the chain was at the right tension and the laser pointed at the centre of the chain links from the rear sprocket to the front sprocket. Tighten the rear axle and the job's done. Glad I bought it. Not disappointed. Makes lining up belt on a Harley dyna child’s play. Good tool. Quality defiantly plasticky so don’t drop on stand on it. Works well easy to use.